Glaucoma is often called the sneak thief of vision because it can develop without obvious symptoms. Although some risk factors, such as high intraocular pressure, are apparent, how these factors contribute to the disease is by no means clear. As a consequence, glaucoma is the leading cause of irreversible blindness throughout the world. Glaucoma is an optic neuropathy that leads to a characteristic pattern of visual field loss by gradually disconnecting the eye from the brain. Glaucoma is treated by medically or surgically reducing intraocular pressure (IOP); while these therapies reduce the rate of progressive vision loss in some patients, it continues in others. Moreover, available surgical techniques required to reduce IOP in advanced disease may lead to vision-threatening complications. The search for new therapies necessitates an understanding of the mechanisms by which the optic nerve degenerates, with the ultimate goal of identifying novel ways to treat, or possibly prevent, glaucoma. astrocytes in red, axons (neurofilament) in green, and cell nuclei counterstained in blue. 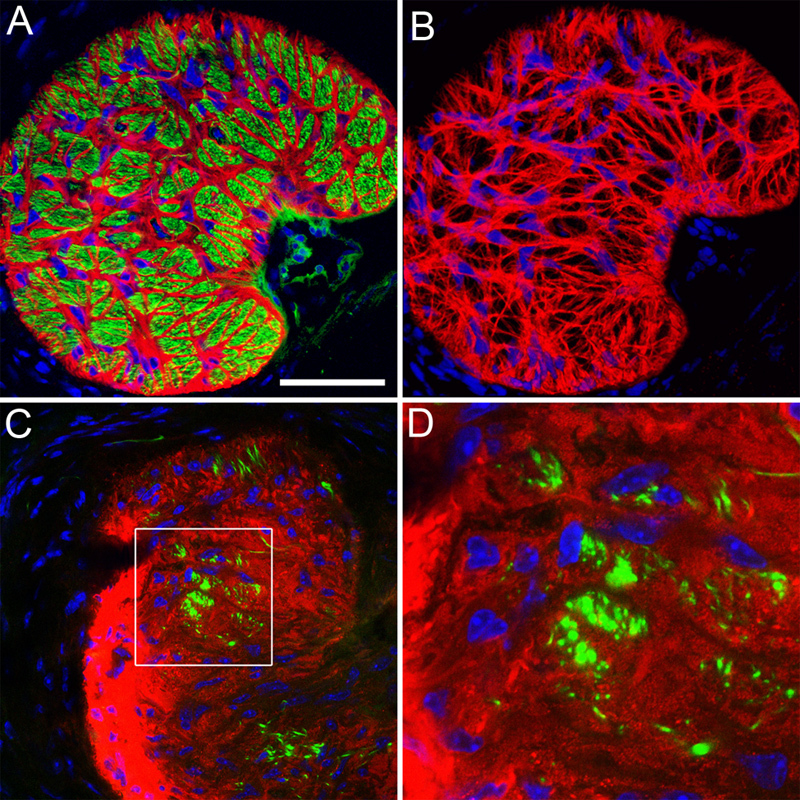 The image shows a single confocal section. Scale bar = 50 μm. B, the meshwork of astrocytes in the glial lamina. The image shows a volume reconstruction of 10 image planes taken on a confocal microscope with astrocytes in red and nuclei in blue. C, cross section through the glial lamina of an optic nerve with severe glaucomatous degeneration. The astrocytes (red) appear as a glial scar. Only a few axon bundles are left (green). D, higher magnification of the boxed area in C.
The image intensity was optimized for each picture individually. (Investigative Ophthalmology & Visual Science February 2013, Vol.54, 909-917. doi:10.1167/iovs.12-10109. Copyright 2013 Association for Research in Vision and Ophthalmology). Much evidence points to the optic nerve head (ONH) at the back of the eye as the critical site in the initiation of glaucomatous damage. Despite considerable research efforts over the past decades, our knowledge of the cellular and molecular mechanisms that cause glaucomatous optic nerve axonal degeneration at the ONH remains largely incomplete. In 2010, scientists participating in the Lasker/IRRF Initiative for Innovation in Vision Science identified knowledge gaps in glaucoma research and proposed innovative strategies to accelerate the discovery of sight-saving treatments and prevention of the disease using novel scientific, engineering and technological approaches. The report, Astrocytes and Glaucomatous Neurodegeneration, was published in November 2010. Five years later, many of the same scientists gathered to assess progress since the initial report was completed; their exciting findings were published in Experimental Eye Research. One of the key issues discussed in these meetings is that astrocytes are a critical element of glaucoma pathophysiology. Their role in the molecular and cellular mechanisms that are the behind axonal damage in the glaucomatous ONH have advanced the field considerably. Emerging concepts on the biomechanical changes in the ONH and exciting data that have been generated on this issue in the last few years include new insights on the biomechanical forces that act on this tissue in the normal eye and in those with glaucoma. This is critical to understanding the mechanisms that lead to structural changes at the ONH. For example, an increase in strain on the peripapillary sclera that surrounds the ONH has been identified as a possible initiating event that may trigger astrocyte reactivity in the ONH, possibly via transforming growth factor-β signaling. Reactive astrocytes in the ONH are expected to change homeostasis in the ONH microenvironment, causing axonal degeneration. An entirely novel concept to explain axonal damage in glaucoma is neuroinflammation. New regenerative therapies for optic nerve axons that are damaged in glaucoma may be possible once we learn to prevent astrocyte reactivity and neuroinflammation at the ONH through which regenerating axons need to pass. The challenge here is to ensure that connections with appropriate targets in the brain are formed and are functional. Progress is also being made toward developing neuroprotective therapies for glaucoma. Success using animal models of glaucoma has helped identify the requirements for treatments that can be translated into clinical practice. While glaucoma is often an intractable disease, considerable progress is being made. The need for a way to more effectively treat or even prevent glaucoma is great, and an increased understanding of the disease will bring us closer to the day when those at risk for or who have the disease will no longer be robbed of their sight.